Crepes are some very tasty, versatile things. You can serve them sweet for dessert or savory for a meal. We would categorize these as dessert crepes, but if you eat them for your main course, we won’t judge! Taking into consideration the cooking skills of the average college student, we recommend the following recipe below, but if you want to take on the more advanced Crepe Suzette (read: setting your crepe sauce on fire), try the William Sonoma recipe. Whisk all the batter ingredients until completely smooth; place batter to rest in the refrigerator for at least 20 minutes. Melt 1 tablespoon butter in a crepe pan or large skillet over low-medium heat. Add 3 tablespoons of batter to the pan and swirl until the bottom of the pan is covered with batter. Cook the crepe for one minute, or until the crepe is slightly moist on top and golden underneath. Loosen the edges of the crepe, slide the spatula under it and then gently flip it upside down into the pan. 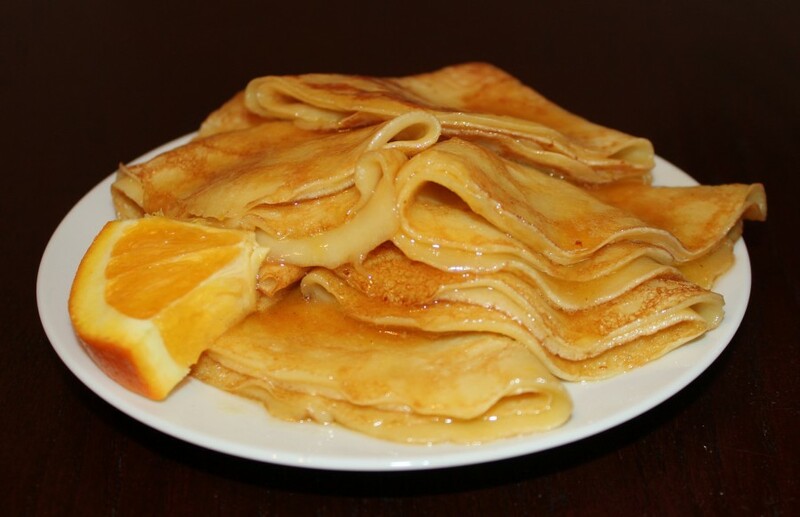 Cook for one minute and transfer the cooked crepe to a plate to keep warm. Repeat with the remaining batter. Combine orange juice, sugar, and orange zest and bring to a boil. Allow the juice to boil for five minutes until it’s a slightly thick sauce. Remove the orange sauce from the heat and stir in the orange liqueur and oranges. Add the crepes to the pan and coat both sides in the orange syrup. Serve crepes by folding into quarters or rolling them into cylinders. Place a scoop of ice cream next to each crepe and drizzle the Crepe Suzette with the orange syrup. Voilà! You can now enjoy this fine dessert!